Pixel Dan gives us a look at the first Masters of the Universe Classics figure from the New Adventures of He-Man animated series: the cycloptic cyborg Optikk. Optikk will be available from Mattycollector.com on the 15th of May, or to subscribers as the Club Eternia figure of the month. 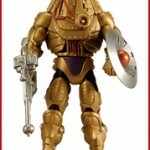 The Fwoosh has some great new photos of the upcoming Masters of the Universe Classics Optikk. This is their first figure based on The New Adventures of He-Man, and it clearly looks like a winner. The figure is due out in May, along withthe highly anticipated Tytus. The original post can be seen Here, but a few mirrored images can be seen by clicking the headline of the story. May is a big month for MattyCollector.com. Not your every day large, but UNBELIEVABLY ENORMOUS… as in Tytus™, Heroic Giant Warlord™ huge! Yep, for the first time, Tytus™ will be offered here on MattyCollector.com, and at 12″ tall, he’s twice the height of MOTUC figures like He-Man®! We’ve also got Optikk™, our first figure from the “New Adventures” line, and more collector must-haves. Plus, if you missed our Retro-Action™ DC Super Heroes Green Arrow figure the first time he was offered, we’ll have a small amount available for purchase. Subject to change, here’s the complete list of products we’ll have for sale on Monday, May 17th. Be sure to click into each product for all the details. 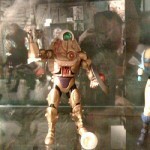 MattyCollector has posted new in-package pictures of Optikk from The New Adventures of He-Man cartoon series. Optikk is the first Space Mutant from New Adventures to appear in the MOTUC line, and is the May Club Eternia figure. Discuss on the Toyark Forums› Views: 3402 › Credit: TheSymbiote of the Toyark Forums! Here are the first pictures of the new Masters of the Universe Classics figure revealed this evening from the Gallery 1988 art show by way of AFI: it’s Optikk from the New Adventures of He-Man, which will be the May 2010 figure. Also revealed are Evil Lyn‘s secret accessories: Screech with the battle armor and perch. Also the orb can be put on both her staff or wand. Click the thumbnail for a look at the images. Also attached are four accessories which act as hints for upcoming figures in the MOTUC line.